When CompTIA issued their 3rd Annual State of the Channel Study last year, we read it closely. 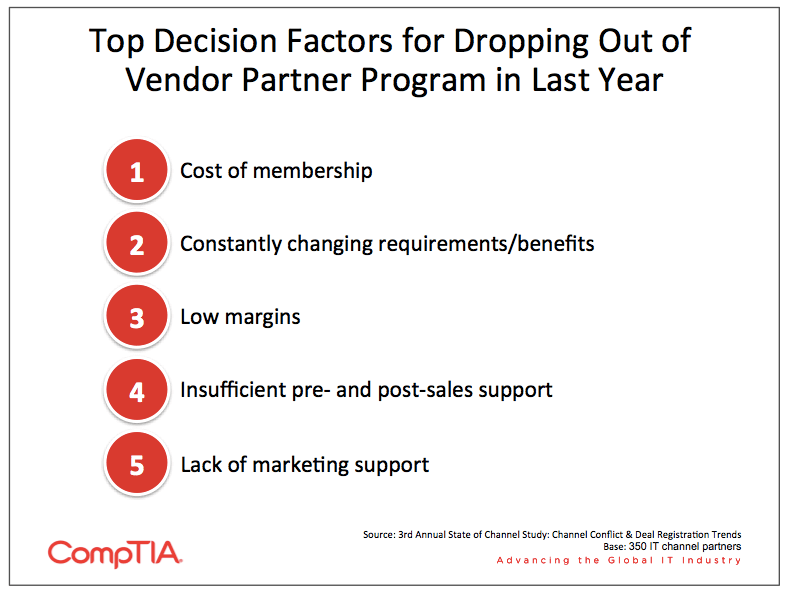 And we took careful notice of the reasons industry vendors gave for leaving a provider’s partner program. If you’ve seen our recent Partner Pledge video, you understand how committed Intermedia is to the channel. But our commitment goes beyond mere words. When we were crafting our enhancements to our partner program, we made sure to strengthen our program across EACH of the industry-wide pain points identified by CompTIA—including channel conflict. Take a closer look to see how we compare. 77% of channel firms reported at least one lost deal due to channel conflict. 41% lost 5 deals or more. Private label partners have full flexibility to bundle their services with Intermedia’s. By bundling in their own support, onboarding and administrative services, partners typically reach margins of 40-60% or higher. To learn more about how we’re empowering the business cloud for our partners, visit our partner program page or contact our sales team at (888) 299-2522. For the latest channel news, follow us on Twitter at @Sell_Intermedia.